Centromeres and telomeres of higher eukaryotes generally contain repetitive sequences, which often form pericentric or subtelomeric heterochromatin blocks. C-banding analysis of chromosomes of Azara's owl monkey, a primate species, showed that the short arms of acrocentric chromosomes consist mostly or solely of constitutive heterochromatin. The purpose of the present study was to determine which category, pericentric or subtelomeric, is most appropriate for this heterochromatin, and to infer its formation processes. We cloned and sequenced its DNA component, finding it to be a tandem repeat sequence comprising 187-bp repeat units, which we named OwlRep. Subsequent hybridization analyses revealed that OwlRep resides in the pericentric regions of a small number of metacentric chromosomes, in addition to the short arms of acrocentric chromosomes. Further, in the pericentric regions of the acrocentric chromosomes, OwlRep was observed on the short-arm side only. This distribution pattern of OwlRep among chromosomes can be simply and sufficiently explained by assuming (i) OwlRep was transferred from chromosome to chromosome by interaction of pericentric heterochromatin, and (ii) it was amplified there as subtelomeric heterochromatin. OwlRep carries several direct and inverted repeats within its repeat units. This complex structure may lead to a higher frequency of chromosome scission, and thus may be a factor in the unique distribution pattern among chromosomes. 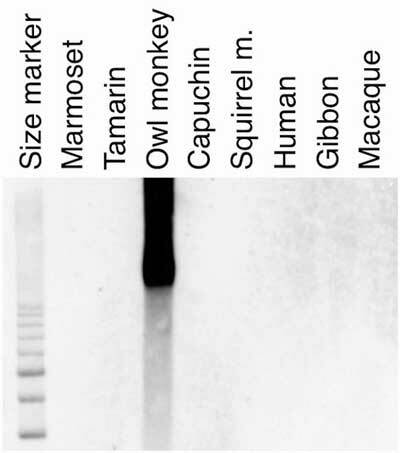 Neither OwlRep nor similar sequences were found in the genomes of the other New World monkey species we examined, suggesting that OwlRep underwent rapid amplification after the divergence of the owl monkey lineage from lineages of the other species. DNA Research 20 (2013): accepted for publication.